This gets all the distinct combinations of order date and ship date from the fact table plus their related calendar years. 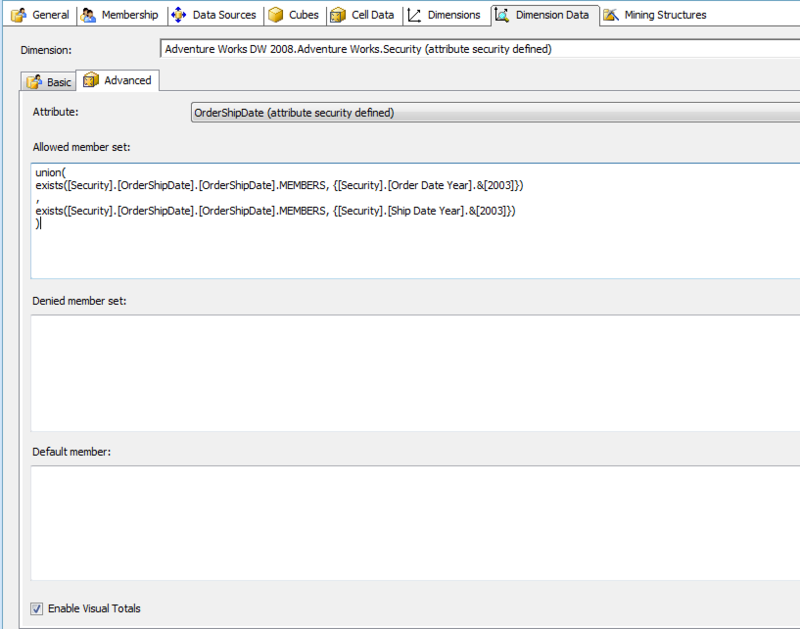 Obviously this exact query might not be practical on a large fact table, but you get the idea – in order to apply dimension security to the range of cells we want, we need to create a new dimension designed so that its members can be mapped onto those cells. 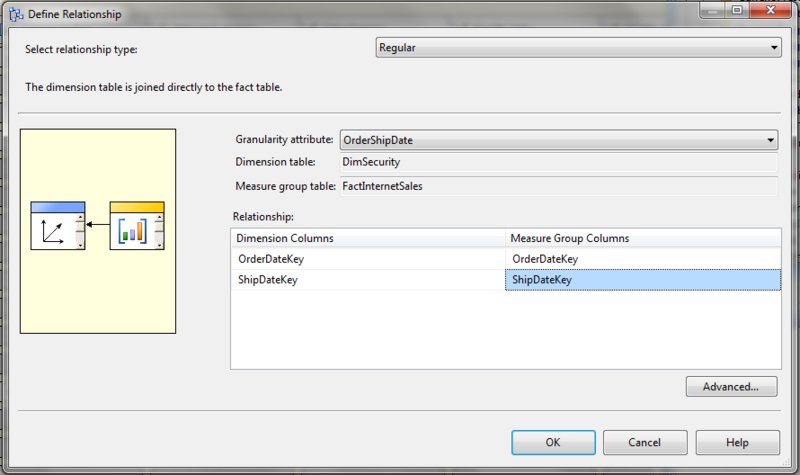 A key attribute called OrderShipDate that has a composite key based on the OrderDateKey and ShipDateKey columns. 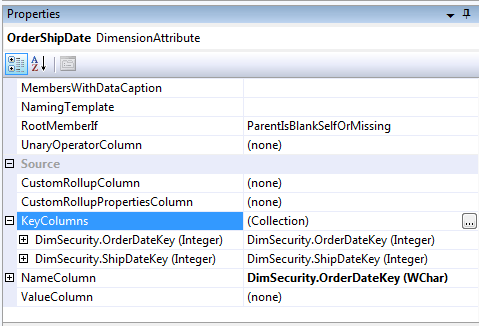 I used the OrderDateKey column as the name column, but that’s not too important because this dimension will be hidden anyway. This attribute represents the distinct combination of order date and ship date. 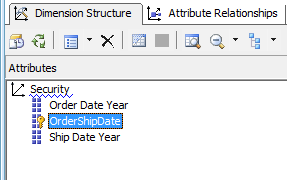 Two other attributes, Order Date Year and Ship Date Year, based on the OrderDateYear and ShipDateYear columns. You can now set this dimension’s Visible property to False in the Cube Structure tab of the Cube Editor. This grants access to all combinations of Order Date and Ship Date – all the members on the OrderShipDate hierarchy – that are either in the Order Date year 2003 or the Ship Date year 2003. 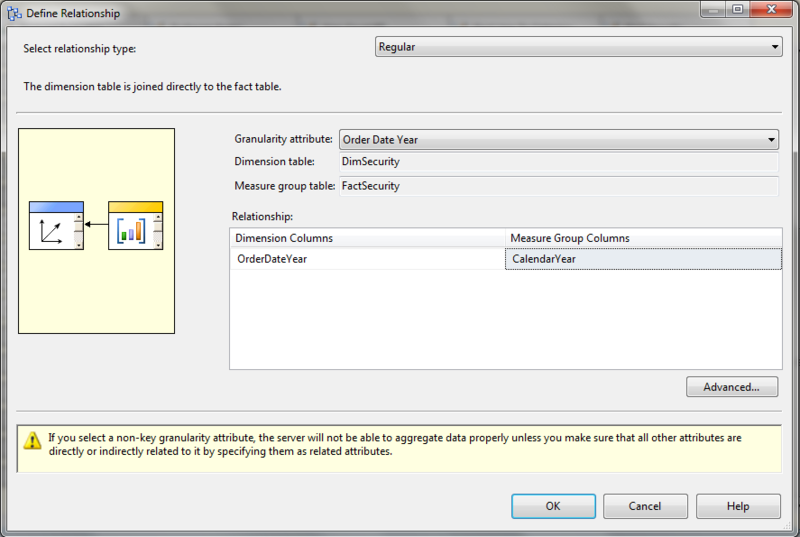 Don’t forget to check the Enable Visual Totals box too. So we have the basic role working, but how can we make it dynamic? We don’t want to create a factless fact table that contains rows for every combination of Order Date and Ship Date because that could get very large very quickly; we only want to grant access at the year level. This takes the set returned by the previous expression and then loops over it using Generate; for each member in the set we then find the equivalent Ship Date Year by using LinkMember. In summary, while this might seem quite complicated the MDX used for the equivalent cell security implementation would be equally bad and the performance overhead much worse, so this is a very useful technique to have in your toolkit. Thanks are due to Peter Holzner, Ramon Mueller, Beat Stuenzi, Chris Fleming and Adam Widi for working through all this with me the other week.